Investment and Social Commentary of a former investment advisor. Could it be? Is it possible? Can the Dow Jones Industrial Average be allowed to suffer a monthly decline? Since the Fed’s QE2 was announced in September, 2011, only the month of November has experienced a loss. That loss was probably due to the mid-term elections. Otherwise, every month has shown a gain. Yet, May began with a thud. By Friday the 27th, the Dow had registered a loss of some 400 points. The past week, the last full week in May, was a most curious week. Monday started with an immediate selloff that threatened the market with something ominous. A correction was in the cards should the precious Dow continue to fall. So, around midday the indices turned up. Only at the end of the day, there was a rather nasty rash of selling in the final thirty minutes of trading. Insert each day of the week for Monday in the previous sentence and you have the week in perfect recap. Each day suffered from selling just before the close. Well, except for Friday. As the selling started to get out of hand, some buying did overcome the selling. No doubt the PPT had an active roll in trying to prop up the markets this week. No doubt as well, sellers were looking to unload as the market rallied. In all, May still looks to be a negative month with one trading day left. What should we make of this? The action resembled triangles of terror. The Fed has been trying so desperately to sell the world on economic recovery and lead the world into believing the answer to every problem lies in central banking wisdom. Their ploy has been to prop up the market indices to distract and mislead the masses. Yet, it is obvious that some investors want out. 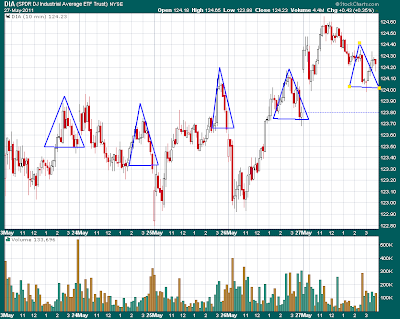 As the PPT bids the market up, sellers take it down to form triangle trading patterns. It would appear that the PPT wanted to mute the market decline in the last week in May so investors’ won’t be exposed to an ugly monthly statement. That way they won’t concentrate on real estate devaluation, inflation, and high unemployment. You know - the ‘green shoots’ of recovery. But as we turn the calendar to June, look out! These same manipulators might let the sellers have some fun as we blast into the month of QE2 termination. We might find out the real fundamentals of the market. No Fed - No Market! The chart below is the DIA over the last full week in May with 10-minute bars. 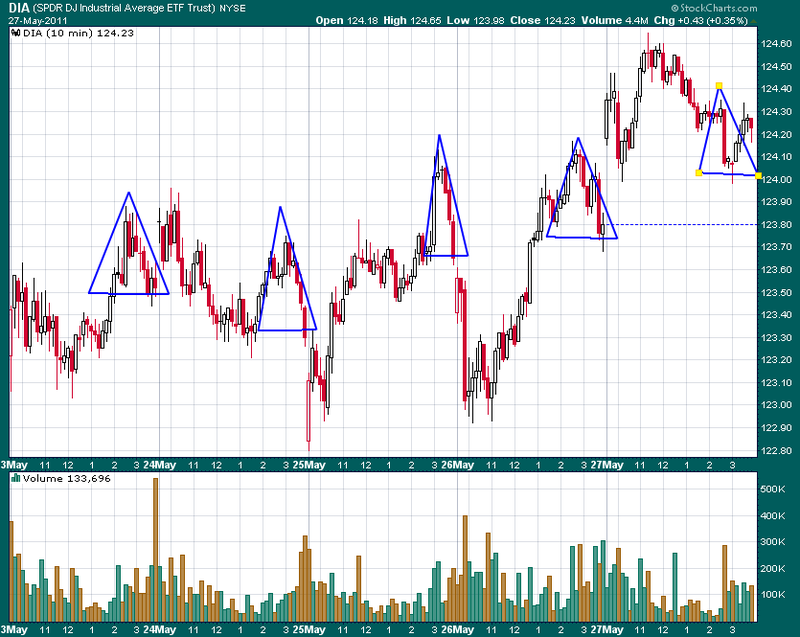 The blue triangles are the triangles of terror that forced the PPT to save the market each day. Notice the volume increases at the bottom of the chart that correspond to the selling. Also notice the immediate and sharp changes in trend. There is almost no rounding turns on this chart. One minute the market is going down. The next minute the market is going up. This economic news this week was almost all bad. Home sales were down, durable goods were down, unemployment claims were up, and Greece was still broke. And yet the band played on. Let’s see if the PPT still wants to play this game in June. The triangles of terror must be scaring the crap out of them to bring out their desperation. Disclaimer: The views discussed in this article are solely the opinion of the writer and have been presented for educational purposes. They are not meant to serve as individual investment advice and should not be taken as such. This is not a solicitation to buy or sell anything. Readers should consult their registered financial representative to determine the suitability of any investment strategies undertaken or implemented. BMF Investments, Inc. assumes no liability nor credit for any actions taken based on this article. Advisory services offered through BMF Investments, Inc.
All articles published on this site are the opinion of the writer, Barry M. Ferguson, and are intended solely for discussion and education. Nothing herein should be construed as an offer to sell anything nor as individual investment advice. Every investors' situation is different and as such, should consult directly with a professional advisor before buying or selling any position in any security. Any decisions made from any information from this blog are done entirely at the readers own risk. The writer assumes no responsibility for non-clients.